This tutorial introduces you to the programming model of Eclipse RCP applications. 6.1. What is the application model? 15.3. On which objects does Eclipse perform dependency injection? 16.1. What is the Eclipse context? 16.2. Which model elements have a local context? 16.5. How to access the model objects? The Eclipse IDE version 2.0 started as a modular IDE application. The Eclipse 3.0 version from 2004 allowed building stand-alone applications based on the same Eclipse frameworks. At this point, the term Eclipse RCP was coined. Eclipse RCP is short for Eclipse Rich Client Platform and indicates that the Eclipse framework is used to create feature-rich stand-alone applications. The release of Eclipse in version 4.x simplified and unified the Eclipse programming model. It is based on state-of-the-art technologies, like dependency injection and declarative styling via CSS files. The Eclipse platform forms the basis of the most successful Java IDE. The framework is very stable and broadly used. By default, it provides native user interface components which are fast and reliable. It has a strong modular approach it allows developers to design component based systems. Companies such as Redhat, IBM and SAP use the Eclipse framework as a basis for their products and therefore ensure that the Eclipse framework remains flexible, fast and continues to evolve. The Eclipse platform also fosters a large community of individuals which provide support, information and extensions to the Eclipse framework. The Eclipse IDE can be viewed as a special Eclipse application with the focus on supporting software development. For example, the Java development tools (JDT) provide the functionality to develop Java applications. An Eclipse application consists of individual software components, called plug-ins. They can use and extend existing components. The most important configuration file for plug-ins is the MANIFEST.MF file. It defines the meta data of the plug-in, like its unique identifier, its exported API and its dependencies. For example, a new plug-in can create new menu entries or toolbar entries. 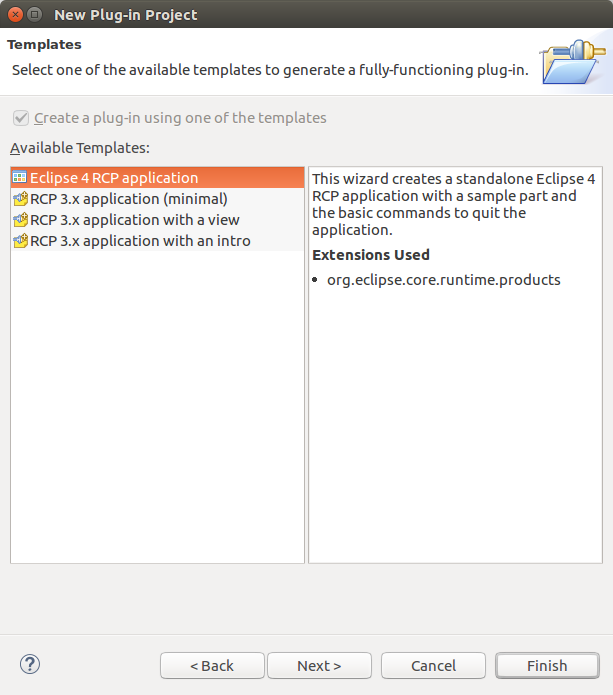 An Eclipse RCP application typically uses the same base components as the Eclipse IDE. On top of these, they add application specific components as depicted in the following graphic. Eclipse applications use the Equinox runtime. This runtime is implemented based on the OSGi specification. This specification describes a modular approach to develop component-based Java applications. It also defines dynamic software components, i.e., OSGi services. As user interface toolkit, most Eclipse RCP applications use SWT(Standard Widget Toolkit) and additional extensions of SWT. Download the latest release of the Eclipse SDK build from the SDK download page. Click on the link of the latest released version (the release version with the highest number). The download download section should look similar to the following screenshot. Linux uses the tar.gz format. The e4 tools provide tools to develop Eclipse plug-ins and applications. If there are not part your Eclipse distribution, you can install them via your release update site. Use menu:[Help|Install New Software…​] and select the update site of your release. If you are using the latest release, you use the following stable update site. Install the tools and restart the Eclipse IDE afterwards. The official website for the e4 tools be found on the Eclipse.org e4tools site. 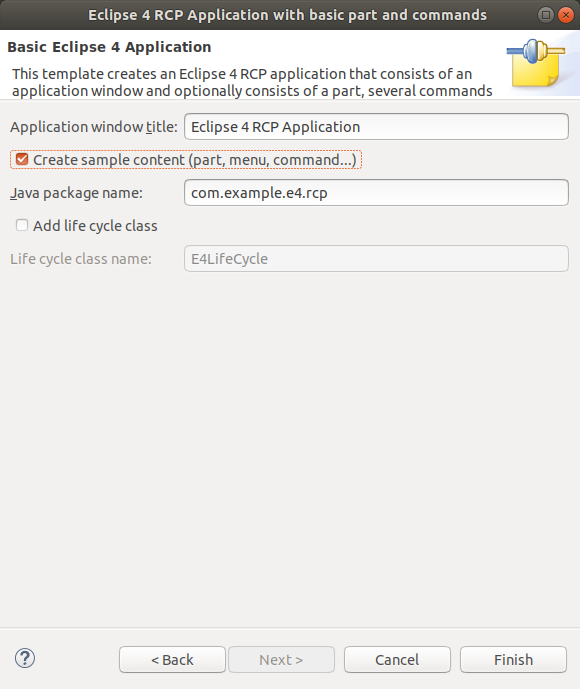 The following exercise demonstrates how to create an Eclipse RCP application based on a template. It also shows how to start the application via the Eclipse IDE. You learn all the details of what happened here in later chapters. 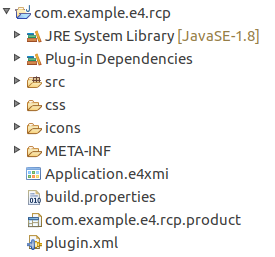 Create a project called com.example.e4.rcp via the File New Other…​ Plug-in Development Plug-in Project from the menu of your Eclipse IDE. Use the settings similar to the following screenshots, most of them are the default settings. On the last wizard page, select the Create sample content (parts, menu etc.) flag. Via this flag you configure that the generated application has example content, e.g., a view and some menu and toolbar entries. The wizard adds the clearPersistedState startup option to the product configuration file. This ensures that the latest state of your application model is used once the application is started. Open the generated product file by double-clicking on the file. Switch to the Overview tab in the editor and launch your Eclipse application by pressing the Launch an Eclipse application hyperlink. This selection is highlighted in the following screenshot. As a result your Eclipse application should start. The application should look similar to the following screenshot. The Eclipse platform uses an abstract description, called the application model, to describe the structure of an application. This application model contains the visual elements as well as some non-visual elements of the application. The visual parts are, for example, windows, parts (views and editors), menus, toolbars, etc. Examples for non-visual components are handlers, commands and key bindings. Each model element has attributes which describe its current state, e.g. the size and the position of a window. The application model also expresses the relationship of the model elements via a hierarchy. The individual user interface widgets, which are displayed in a part, are not defined via the application model, e.g., the content of the part is still defined by your source code. If the application model was a house, it would describe the available rooms (parts) and their arrangement (perspectives, part stacks, part sash containers), but not the furniture of the rooms. This is illustrated by the following image. The base of the application model is typically defined as a static file. For RCP application this file is, by default, called Application.e4xmi and located in the main directory of the plug-in which defines the product extension. The Eclipse IDE ships with its own base application file. This file is read at application startup and is used to construct the initial application model. Changes made by the user are persisted and re-applied at startup. The application model is extensible, e.g., other plug-ins can contribute to it via model processors and model fragments. Model elements can point to a class or to a static resource via a Uniform Resource Identifier (URI). For this purpose Eclipse defines two URI patterns. Eclipse instantiates the referred objects or resources in most cases lazily. For example, the classes for a part are instantiated when the part gets visible. The following table describes the support URI patterns. The example assumes that the bundle is called test to have a short name. Identifier for a Java class. It consists of the following parts: bundleclass:// is a fixed prefix. Bundle-SymbolicName is defined in MANIFEST.MF file. The Bundle-SymbolicName is followed by a '/' and the fully qualified classname. Used to identify resources. Identifier for a resource in a plug-in. platform:/plugin/ is a fixed prefix, followed by the Bundle-SymbolicName, followed by the path to the file and the filename. For example a part, have a Class URI attribute which points to a Java class via the bundleclass:// URI. This class provides the behavior of the part. The corresponding object is created by the Eclipse framework. Using the house/rooms metaphor from earlier, the class is responsible for defining the furnishings, the layout of the room and how the interactive objects behave. An example for a static resource reference is the the Icon URI attribute of a part. This attribute can point to an icon that is used for the part. The following model elements represents the basic elements which you use to create the user interface of your application. Eclipse applications consist of one or more windows. Typically, an application has only one window, but you are not limited to that, e.g., if you want to support multiple connected monitors. Parts are user interface components which allow you to navigate and modify data. Parts can be stacked or positioned next to each other depending on the container into which they are dropped. A part can have a drop-down menu, context menus and a toolbar. Parts can be classified as views and editors. A view is typically used to work on a set of data, which might be a hierarchical structure. If data is changed via the view, this change is typically directly applied to the underlying data structure. A view sometimes allows the user to open an editor for the selected set of data. 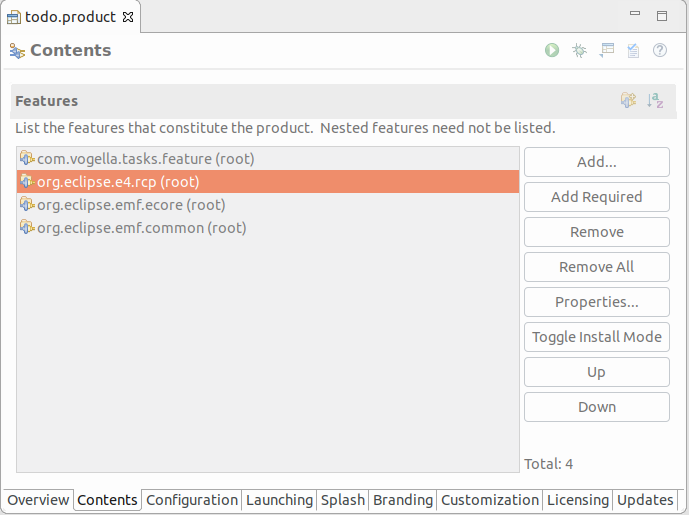 For example, the Package Explorer view allows you to browse the files of Eclipse projects. If you for example rename a file via the Package Explorer view, the file name is directly changed on the file system. Editors are typically used to modify a single data element, e.g., the content of a file or a data object. To apply the changes made in an editor to the data structure, the user has to explicitly save the editor content. For example, the Java editor is used to modify Java source files. Changes to the source file are applied once the user selects the Save button. A dirty editor tab is marked with an asterisk left to the name of the modified file. Parts can be directly assigned to a window or a perspective. 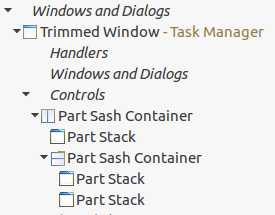 They can also be grouped and arranged via additional model elements, i.e., via part stack (Part Stack) or via part sash container (Part Sash Container) elements. A part stack contains a stack of parts showing the content of one part while displaying only the headers of the other parts. One part is active and the user can switch to another part by selecting the corresponding tab. A part sash container displays all its children at the same time either horizontally or vertically aligned. The following screenshot shows a simple Eclipse application layout using two part sash container and three part stacks. On the top of this layout there is a horizontal part sash container which contains another part sash container and one part stacks. The part sash container on the next level contains two part stacks. The hierarchy is depicted in the following graphic. You can use the Container Data attribute on a child of a part sash container to assign a layout weight. This layout weight is interpreted as the relative space the corresponding child element should get assigned in the part sash container. The setting is depicted in the following screenshot. If you set the Container Data for one element, you must define it for all the other elements, too. Otherwise the missing values are interpreted as very high and these elements take up all available space. TIP:The initial total of all the container data values is maintained when elements in the sash are moved. In order to allow fine grained/smooth dragging this total must be similar to the screen resolution. A too low value (i.e., 50 / 50) causes the part to be moved multiple pixels per sash unit, which the user will realize as a jerky movement. Therefore, use a sufficient high value, e.g., 10000. A perspective is an optional container for a set of parts. Perspectives can be used to store different arrangements of parts. For example, the Eclipse IDE uses them to layout the views appropriate to the task (development, debugging, review, …​) the developer wants to perform. You can place perspectives in a perspective stack of the application model. Switching perspectives can be done via the part service provided by the Eclipse platform. During startup the Eclipse framework parses the available information about the application model (Application.e4xmi, persisted user changes and model contributions). It stores this information in Java objects during runtime. These objects are called model objects and at runtime they represent the attributes from the model elements. The following table lists the types of the important model objects. Describes the application object. All other model elements are contained in this object. A self-contained component typically without user interface. It can register for events in the application life cycle and handle these events. Represents a window in your application. Similar to MWindow but it allows containing toolbars for the windows (via the TrimBars model elements). Represents a different layout of parts to be shown inside the window. Should be contained in a MPerspectiveStack. Represents the model element part, e.g., a view or an editor. Property of MPart which can be injected. If set to true, this property informs the Eclipse platform that this Part contains unsaved data (is dirty). In a handler you can query this property to provide a save possibility. MPartDescriptor is a template for new parts. A new part based on this part descriptor can be created and shown via the Eclipse framework. Snippets can be used to pre-configure model parts which you want to create via your program. You can use the Eclipse framework to clone such a snippet and use the result object to attach it to the application model at runtime. Eclipse applications are based on the modularity of plug-ins. Every plug-ins can contribute to the application model. Static contributions are contributed via text files. These extensions are called fragments or model fragments. Dynamically contributions are contributed via Java classes. These extensions are called processors or model processors. These model contributions are registered via the org.eclipse.e4.workbench.model extension point. This extension point is defined in the org.eclipse.e4.ui.workbench plug-in. The model contributions are read during startup and are used to build the runtime application model. At runtime of the application the created set of model objects is called the runtime application model. This runtime application model is dynamic, i.e., you can change the model objects and its attributes and these changes are reflected in your application. The Eclipse platform has change listeners registered on the model objects and updates the user interface whenever you change relevant attributes. Changes during runtime, are written back to the model. For example, if the user positions a part into another stack via drag and drop. If the Eclipse application is closed, theses changes are recorded and saved in the workbench.xmi file. This file is located in the .metadata/.plugins/org.eclipse.e4.workbench folder. User changes can be deleted at start of your application via the clearPersistedState parameter as a launch parameter. In most cases this is undesired behavior for an exported application and only used during development. These different components of the runtime application model need to be combined. The Eclipse platform creates the runtime application model based on the initial application model(Application.e4xmi) and applies the model contributions to it. User deltas are applied afterwards. If these deltas do not apply anymore, e.g., because the base model has changed, they will be skipped. The deltas are applied to the model based on the IDs of the user interface component. The automatic persistence of the application model is misleading during development. The developer adds a new part and this part is not visible after startup of the application because Eclipse assumes that the user closed it in an earlier session. Use the clearPersistedState parameter to avoid the processing of user changes at startup. The programming model of Eclipse 3.x primarily uses extension points to define contributions to the application. These extensions define new parts, new menus, etc. This approach is no longer used in modern Eclipse RCP applications. All contributions are made via fragments or processors. If your are using the compatibility layer, Eclipse stills supports plug-in based contributions. A model fragment is a file which typically ends with the .e4xmi extension. It statically specifies model elements and the location in the application model to which it should be contributed. For example, a fragment can contribute a new menu containing several new menu entries. The e4 tools project provides a wizard and an editor for model fragments. The application model editor also allows you to extract a subtree into a new or existing fragment. Select a model element, right click on it and select Extract into a fragment from the context menu. In fragments you contribute to an existing model element. You also have to specify the Featurename to which you want to contribute. A Featurename is a direct link to the structure of the application model. The following table lists some Featurename values and their purposes. The following table gives several examples how you can use XPath expressions to define the model element you want to extend. The slash (/) always addresses the root element of an XML file, which always is the MApplication element. Contribute to the main menu. Contribute to all children of the main menu, e.g. to every menu in it. Contribute to the first child of the main menu. In most applications this would be the menu:File menu. Contribute to the first Menu of the main menu. This xpath is more detailed than the one above since it also requires that the main menu child is of type menu:Menu. In most application this would be the menu:File menu. Contribute to the bottom trimbar. Contribute to the top trimbar. When the MTrimBar is on top the side attribute is omitted, therefore not(@side) is used. Contribute to a MPart which is tagged with the Editor tag. A nice tool for evaluating XPaths is the Eclipse XPath evaluation plug-in. Positions the element on the beginning of the list. Places the new model elements before the model element with the ID theOtherElementsId. Places the new model elements after the model element with the ID theotherelementsid. Fragments of independent plug-ins are processed in the order of the dependencies in the MANIFEST.MF file. Therefore, first or index might not always result in the desired outcome. A processor allows contributing to the model via program code. This enables the dynamic creation of model elements during the start of the application. The following description uses feature projects and products, please see Eclipse Products and Deployment for a description of these topics. In this exercise you create a standard Eclipse plug-in. Afterwards, you convert the generated plug-in into an Eclipse RCP application. This plug-in is used as basis for your user interface components. If you created other projects earlier, it is recommended that you close them or remove them from the workspace to avoid side effects. To close a project, right click on it and select Close from the content menu. To remove a project from the workspace, right click on it and select Delete from the content menu. In the resulting dialog DO NOT set the "Delete project content on disk" flag, this way you can later import the project again, if needed. If you are using a target definition file, the corresponding project must of course stay (open) in the workspace. Create the com.vogella.tasks.ui plug-in project via the File New Other…​ Plug-in Development Plug-in Project menu entry. On the first wizard page enter com.vogella.tasks.ui as project name and press the Next button. If you click the Next button instead of Finish, the wizard shows you a template selection page. So not make a selection and finish the wizard. Open the project and ensure that no Java classes were created in the src folder. In the manifest editor switch to the Dependencies tab and ensure that there are no entries. Create a new project called com.vogella.tasks.product via the File New Others…​ General Project menu entry. Right-click on the com.vogella.tasks.product project and select File New Others…​ Plug-in Development Product Configuration. Create a product configuration file called todo.product inside the com.vogella.tasks.product folder. Press the Finish button. The file is created and opened in an editor. Press the New…​ button on the Overview tab of the product editor. Enter to-do as the Product Name, your plug-in as the Defining Plug-in, product as the Product ID and select org.eclipse.e4.ui.workbench.swt.E4Application in the Application combo box. Switch to the Configuration tab in the product editor and press the Add Recommended…​ button. These settings are for example used by the Maven/Tycho build system, hence it is good practice to configure them. Create a new feature project called com.vogella.tasks.feature via File New Other…​ Plug-in Development Feature Project. You can press the Finish button on the first wizard page. Afterwards select the Included Plug-ins tab in the editor of the feature.xml file. Press the Add…​ button and include the com.vogella.tasks.ui plug-in into this feature. Ensure you have added the plug-in on the Included Plug-ins tab to include it into your feature. Using the Dependencies tab is wrong for this exercise. Open your todo.product product file and change your product configuration file to use features. For this select the features option on the Overview tab of the product editor. Select the Contents tab and add the following features via the Add…​ button. If you cannot add one of the listed features to your product, ensure that you have changed your product to be based on features. Older versions of the Eclipse IDE added the current version of the feature. As the version of an included feature may change over time, you should avoid using the feature version number in your product. 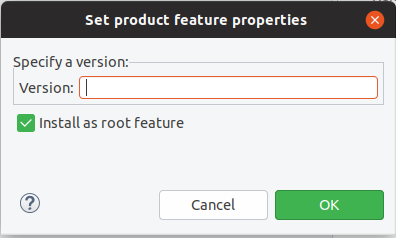 If you version is set, you can remove it via the Properties…​ button on the Contents tab of the product configuration editor. Create an application model file in your com.vogella.tasks.ui plug-in via the File New Other…​ Eclipse 4 Model New Application Model menu entry. Enter your com.vogella.tasks.ui application plug-in as the container and use the file name suggested by the wizard. Press the Finish button to create the application model file and to open it in an editor. 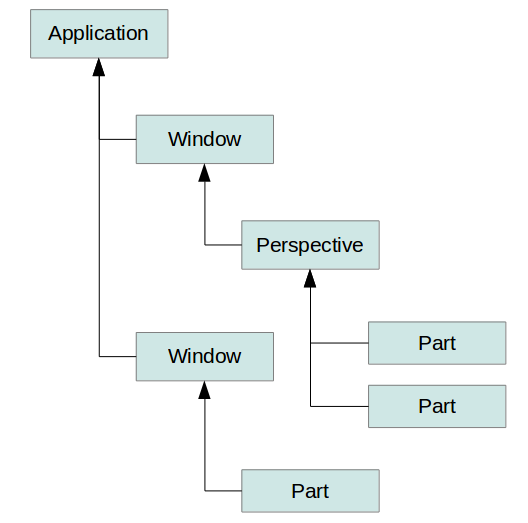 Add one window to your application model. Right-click on the Windows node, and select Trimmed Window as depicted in the following screenshot. Enter an ID with the taskmanager suffix, the position and size of the window and a label as shown in the screenshot below. If you start and close your application the last state of the application is persisted by the framework and restored the next time you start this application. This is undesired during development, as the latest state from the application model file should be used. To ensure that always the latest version of your application model is used, add the -clearPersistedState parameter to your product configuration file. The following screenshot shows this setting in the product configuration file. Open the product file and select the Overview tab. 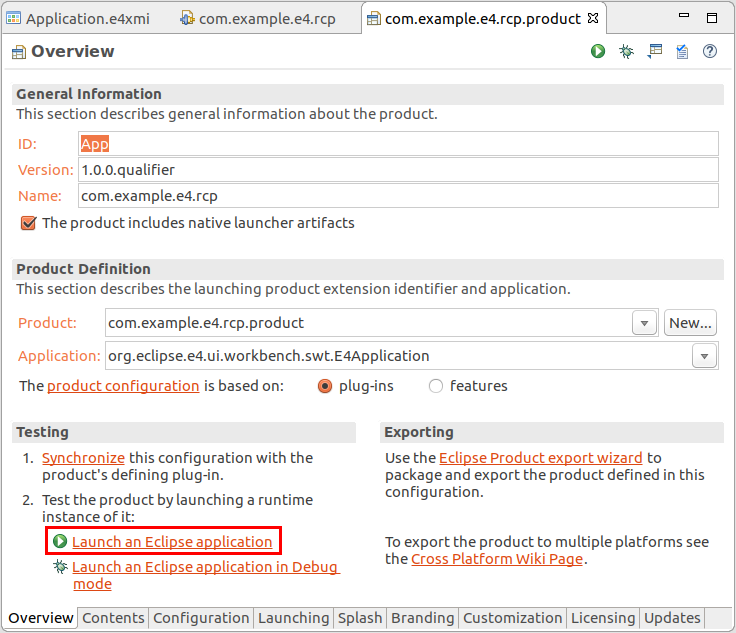 Press the Launch an Eclipse application hyperlink in the Testing section. Validate that your application starts. You should see an empty window, which can be moved, resized, minimized, maximized and closed. In the this part of the exercise, you create the basis of the application user interface. At the end of this exercise, your user interface should look similar to the following screenshot. Open the Application.e4xmi file in the Eclipse 4 model editor via a double-click or right-click on it and select Open With Eclipse 4 model editor. Select Controls below the window and add a part sash container element. Change its Orientation attribute to Horizontal and enter into the ID field the com.vogella.tasks.ui.partsashcontainer.main value. Add a part stack as the first child to your part sash container element. Re-select the parent part sash container and add a part sash container element. Add two part stacks to this new element. After these changes your application model should look similar to the following screenshot. Add one part to each stack. Use the ID’s and labels from the following table. Enter the name first, the ID should be adjusted based on the name, if the label was empty. The final structure of your application model should be similar to the following screenshot. In the screenshot the overview part is selected in the tree hence you see its data. Start your product and validate that the user interface looks as planned. See Desired user interface for the desired result. Reassign your model elements, if required. The model editor supports drag-and drop for reassignment. Also note that you can already see the structure, even though you have not created any Java classes so far. To use classes from other plug-ins in a plug-in, you need to add dependencies to them in the MANIFEST.MF file of the plug-in. In this exercise you prepare the usage of classes from other plug-in. The result should be similar to the following screenshot (version may differ). Create the com.vogella.tasks.ui.parts package in the application plug-in. Theses classes should not extend another class, nor should they implement any interface. You can create the classes by clicking on the Class URI hyperlink in the detail pane of the model editor for the part. This also connects the created class to the model object. If you do this, you can skip Connect the Java classes with your parts. The following code shows the TodoDetailsPart class. In your application model and connect the class with the corresponding part model element. You can do this via the Class URI property of the part model element. The model editor allows you to search for an existing class via the Find…​ button. The initial list of Contribution Classes is empty, start typing in the Class Name field to see the results. The following table gives an overview of which elements should be connected. The following screenshot shows the result for the overview part. Start your application. It should start, but you should see no difference in the user interface. To validate that the model objects are created at runtime check the Console view of Eclipse for the output of the System.out.println() statements. In this exercise you use several SWT widgets to allow to search and display cities on Google maps. This exercise does not always work on a Linux system because on certain Linux versions the Browser widget does not work. See the Eclipse SWT FAQ answered at How do I use the WebKit renderer on Linux-GTK for details. Change the PlaygroundPart class so the part looks like the following screenshot. This example might not work, in case Google changes its API. If you enter a text in the text field and press the button, the map should center based on the input in the text field. This input should be interpreted as city. Your PlaygroundPart class should look similar to the following code. In this exercise you create a model fragment to contribute a part descriptor. Create a simple plug-in project called com.vogella.contribute.parts. The following description abbreviates the plug-in name to the contribute.parts plug-in. In the MANIFEST.MF file, add the following plug-ins as dependencies to your contribute.parts plug-in. Use the fragment wizard to create a new model fragment via the File New Other…​ Eclipse 4 Model New Model Fragment menu entry. Select the contribute.parts plug-in as the container and use fragment.e4xmi as the name for the file. The fragment creation wizard also adds the org.eclipse.e4.workbench.model extension to your contribute plug-in. To review this open the plugin.xml file. If the plugin.xml file is missing, open your MANIFEST.MF file. Select the Overview tab and click on the Extensions link. This shows the Extensions tab in the editor and once you add an extension in this tab the plugin.xml file is generated. If the entry in the plugin.xml is missing you can create it by clicking on the Add…​ button. Afterwards add a new extension for the org.eclipse.e4.workbench.model extension point. Once this has been created, use the a right mouse click to add a fragment to the extension. The resulting plugin.xml file should look similar to the following code. Open the fragment.e4xmi file in its editor. Select the Model Fragments node and press the Add…​ button. Use xpath:/ as extended element id and descriptors as Feature name. Now trigger the right mouse menu and choose Add Child PartDescriptor. Select the Part Descriptor and press the Find button on the Class URI field. Choose the AdditionalInformationPart class we’ve created earlier. The View tag ensures that the Eclipse IDE accepts this part descriptor as valid view, if you use this plug-in in the Eclipse IDE. For pure e4 RCP applications this flag is not needed. Do not forget to press the Add button, after you entered the text. Add the new plug-ins to your feature and start via the product file. Ensure that your part descriptor is present, for example, via the model spy. 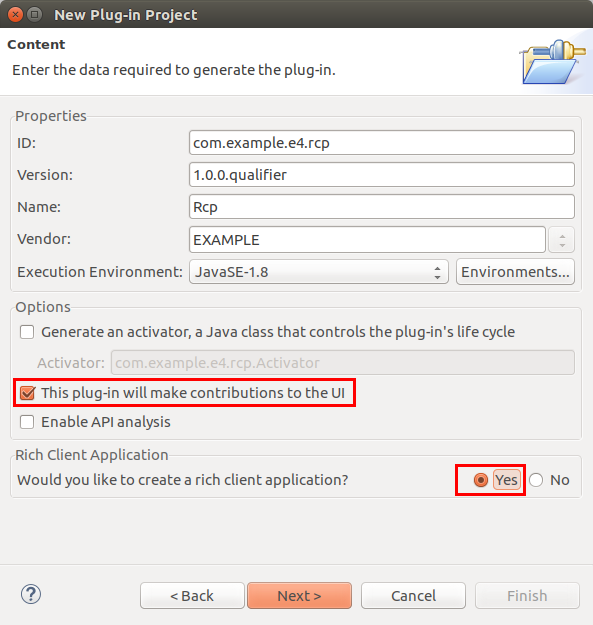 The plug-in can be used to extend the Eclipse IDE or a RCP application. In the Eclipse IDE you can open the additional part via Window Show View Other…​ dialog. The programming model in Eclipse supports constructor, method and field injection according to the Java Specification Request 330 (JSR330). Eclipse also defines additional annotations for the purpose of dependency injection. The most important annotations are covered in Annotations to define class dependencies in Eclipse, other more special annotations are covered in there corresponding chapters. The Eclipse dependency framework ensures that the key and the type of the injected object is correct. For example, if you specify that you want to have an object of type Todo for the "xyz" key, as shown in the following field declaration, the framework will only inject an object if it finds one with an assignable type. The following table gives an overview of dependency injection related annotations based on JSR330 and the Eclipse specific ones. Defined by JSR330, can be added to a field, a constructor or a method. The Eclipse framework tries to inject the corresponding objects into the fields or the parameters of the instance. Defined by JSR330, defines the key for the value which should be injected. By default, the fully qualified class name is used as the key. Several keys for default values are defined as constants in the IServiceConstants interface. Eclipse specific annotation, marks an injected value to be optional. If no valid object can be determined for the given key (and type), the framework does not throw an exception. * for parameters: a null value will be injected; * for methods: the method calls will be skipped * for fields: the values will not be injected. Note that null is an acceptable value to be set in the context, and it is different from a key being removed from the context. For example, if the following is called context.set(SOMEKEY, null), anybody listening for SOMEKEY will be injected with null. Eclipse specific annotation, indicates that updates for this @Inject should be batched. If you change such objects in the Eclipse context, the update is triggered by the processWaiting() method of the IEclipseContext object. This annotation is intended to be used by the platform for performance optimization and should rarely be necessary in RCP applications. The Eclipse platform supports additional annotations for special purposes, e.g., for receiving events (sent by the event service) or working with preferences. The Eclipse runtime creates objects for the Java classes referred by the application model. During this instantiation the Eclipse runtime scans the class definition for annotations. Based on these annotations the Eclipse framework performs the injection. Eclipse does not automatically perform dependency injection on objects which are created in your code with the new operator. The Eclipse framework tracks which object expressed a dependency to which key and type. If the value to which a key points changes, the Eclipse framework re-injects the new value in the object which expressed a dependency to the corresponding type. This means applications can be freed from having to install (and remove) listeners. For example, you can define via @Inject that you want to get the current selection injected. If the selection changes, the Eclipse framework will inject the new value. The re-injection only works on methods and fields which are marked with @Inject. It will not work on parameters injected into constructors and methods which are marked with @PostConstruct, as these methods are only executed once. This does not mean that Eclipse tracks the fields of the value to which the key points. For example if the mykey1 key points to a Todo object as value, and the key points to a new object, this triggers the re-injection of the value to all objects which have a relevant class dependency. But if a field inside the existing Todo object changes, it does not trigger a re-injection. OSGi services are available for dependency injection in Eclipse applications. If you define your custom OSGi services, you can inject them into your model objects. This removes the need to create singleton or factory implementations in your application to access data. If a requested key is not found in the Eclipse context hierarchy, the Eclipse framework dynamically queries for a fitting OSGi service in the OSGi registry. For example, if you have an OSGi service declared for the ITodoService interface you can inject it via the following code snippet into a field of an Eclipse part. During startup of an Eclipse application the Eclipse runtime creates an object based on the IEclipseContext interface. This object is called the context or the Eclipse context. The context is similar to a Map data structure, in which objects can be placed under a certain key. The key is a String and in several cases the fully qualified class name is used as key. The value (to which the key points) can be injected into other objects. But unlike a map, the Eclipse context is hierarchical and can also dynamically compute values for requested keys. For certain model objects (see Which model elements have a local context?) a local context is created. Such a context is associated with an application model object. The different context objects are connected to form a hierarchical tree structure based on the structure of your application model. The highest level in this hierarchy is the application context. A sample context hierarchy is depicted in the following picture. Objects can be placed at different levels in the context hierarchy. This allows that the same key points to different objects in the hierarchy. For example, a part can express a dependency to a Composite object via a field declaration similar to: @Inject Composite parent; Since parts have different local contexts they can receive different objects of the type Composite. The Eclipse framework creates the context hierarchy based on the application model during the start process. By default, it places certain objects under predefined keys into the context, e.g., services to control the Eclipse framework functionality. The model objects and the created objects based on the class URI attributes are created by the Eclipse platform. For each model element with a custom context the Eclipse framework determines which objects should be available in the local context of the model object. If required, it also creates the required Java objects referred by the Class URI property of the model elements. This is for example the case if a part is visible to the user. The renderer framework is responsible for creating the local context of the UI related model elements. This framework allows you to define classes which are responsible for setting up the UI implementation of the model objects. A class responsible for a model element is called the renderer for this model element. For example, the ContributedPartRenderer class is the default renderer for part model objects. This renderer creates a Composite for every part and puts this Composite into the local context of the part. After the initial creation of the Eclipse context hierarchy, the framework or the application code can change the key-value pairs stored in the context. In this case objects which were created with the related Eclipse functionality (for example by the Eclipse dependency injection framework) are updated with the new values. Objects in the context are persisted in memory (transient), i.e., once the application is stopped the context gets destroyed. As described in On which objects does Eclipse perform dependency injection? an object which is created by Eclipse can use annotations to describe its class dependencies. During dependency injection for an object created by Eclipse, the Eclipse framework searches for a fitting object based on the specified key. The search starts in the local context associated with the application model object. If this key is not available, Eclipse continues to search in the parent context. This process continues until the main context has been reached. As you learn in later chapters the Eclipse context is not the only possible source of objects which can get injected. Other examples which are covered later are OSGi services, preferences, events and custom objects. The search happens (mostly) transparently for the caller of the injection. For the class references in the application model, the Eclipse framework creates the corresponding objects when needed. Such an object has access to its corresponding model object via dependency injection. The context can be modified by the application code and the framework. As the Eclipse framework automatically tracks the dependencies of the objects it creates, it can update them as described in Dynamic dependency injection based on key / value changes. 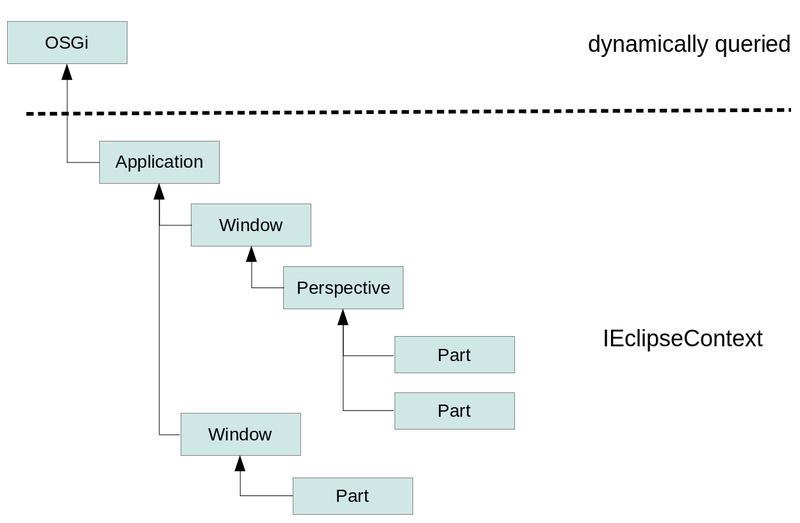 The Eclipse platform places the part which is currently selected and the active shell into the IEclipseContext of the application object. The related keys are defined in the IServiceConstants interface. For example, the following method would allow you to track the current active part in another part. To track the active shell use the IServiceConstants.ACTIVE_SHELL key. Eclipse uses handlers to define actions which can be triggered via menu or toolbar entries. For a handler implementation class it is not necessary to use these qualifiers, as a handler is executed in the active context of the application. The @Active annotation allows you to track values in a child context. The Eclipse framework keeps track of the current active branch in the hierarchy of the IEclipseContext. For example, if the user selects a part, the path in the IEclipseContext hierarchy from the root to the IEclipseContext of the part is the current active branch. With the @Active annotation you can track values in the current active branch of a child element. Whenever the active branch changes and the value of the referred key changes this value is re-injected into the object which uses the @Active annotation. The usage of this annotation is demonstrated by the followingcode snippet. The @Active annotation is currently not used within the Eclipse framework itself and the author of this tutorial has not yet managed to find a good use case for this annotation. If you use a framework in your application, you need to have a convention for how your application interacts with the framework. For example, if a Java object is responsible for handling a toolbar button click, the framework needs to know which method of this object needs to be called. For this purpose every framework defines an Application Programming Interface (API). This API defines how you can interact with the framework from your code. The API also defines the interaction of application objects created or controlled by the framework. Typically, a framework uses inheritance or annotations for this purpose. The "traditional" way of defining an API is via inheritance. This approach requires that your classes extend or implement framework classes and interfaces. The Eclipse 3.x platform API used this approach. The framework defines, for example, an abstract class which defines methods to be implemented. In the example of the toolbar button the method might be called execute() and the framework knows that this method must be called once the button is clicked. API definition via inheritance is a simple way to define an API, but it also couples the classes tightly to the framework. For example, testing the class without the framework is difficult. It also makes extending or updating the framework difficult as such an update may affect clients. This is why the Eclipse 4.x does not use this approach anymore. The Eclipse 4.x platform API is based on annotations, e.g., annotations are used to identify which methods should be called at a certain point in time. These annotations are called behavior annotations. The following table lists the available behavior annotations for parts. Is called after the class is constructed and the field and method injection has been performed. Is called before the class is destroyed. Can be used to clean up resources. Is called whenever the part gets the focus. Is called if a save request on the part is triggered by the Eclipse framework. Is called before the model object is disposed, so that the part is able to save its instance state. This method is called before the @PreDestroy method. The @PostConstruct, @PreDestroy annotations are included in the javax.annotation package. @Persist, @PersistState and @Focus are part of the org.eclipse.e4.ui.di package. Eclipse defines additional behavior annotations for commands and for the application life cycle which are covered in the respective chapters. Behavior annotations imply that the framework needs to provide the specified parameters to the method, i.e., the framework also performs method dependency injection. If you also add the @Inject annotation, the method is called twice, first during the dependency injection phase and later for the behavior annotation. This is typically undesired and therefore an error. It is recommended to construct the user interface of a part in a method annotated with the @PostConstruct annotation. It would also be possible to create the user interface in the constructor, but this is not recommended as field and method injection have not been done at this point. Creating the user interface in an @PostConstruct method requires that @Inject methods are aware that the user interface might not have been created yet. Why is the @PostConstruct method not called? The following description is only valid for Eclipse versions before the Eclipse 4.6 (Eclipse Neon) release. As of Eclipse 4.6 the framework uses the Java version of @PostConstruct and the problem described here, cannot happen anymore. Before Eclipse 4.6, both Java 7 and the Eclipse platform exposed the @PostConstruct annotation. In your Eclipse application you need to tell the framework that the annotation from the Eclipse platform should be used. org.eclipse.core.runtime exports javax.annotation in the correct version. If, for some reasons, you want to avoid a dependency to org.eclipse.core.runtime, you could define a package dependency to the javax.annotation package and set the version to 1.0.0. See Eclipse 4 RCP FAQ for details on this issue. Add the following method to your TodoOverviewPart, TodoDetailsPart and PlaygroundPart classes. In case you created constructors for these classes you can remove them. Run your application and validate that the @PostConstruct method is called. If you receive an error message similar to the following: Unable to process "TodoOverviewPart#createControls()": no actual value was found for the argument "Composite"., ensure you imported the SWT Composite and not the SWT. You can add menus and toolbars to your Eclipse application via the application model. These entries can be positioned at various places. You can, for example, add a menu to a window or a part. Each element define, directly or indirectly, one or several links to a class which is responsible for the execution. These classes are responsible for the behavior once the menu or toolbar entry is selected. Such a class is called handler class. The Eclipse application model allows you to specify commands and handlers. The usage of the commands and handlers model element is optional. You can use the Direct MenuItem or a Direct ToolItem model elements. These entries define a reference to a class (handler class). An instance of this handler class is created by the framework and its annotated methods are called by the framework if necessary. Menus and toolbars support separators. A command is a declarative description of an abstract action which can be performed, for example, save, edit or copy. A command is independent from its implementation details. The Eclipse framework does not provide standard commands, e.g., you have to create all required commands in your application model. The behavior of a command is defined via a handler. A handler model element points to a class (handler class) via the contributionURI property of the handler. This attribute is displayed as Class URI in the model editor. Commands are used by the Handled MenuItem and Handled ToolItem model elements. Prefer the usage of commands over the usage of direct (menu or tool) items. Using commands together with handlers allows you to define different handlers for different scopes (applications or part) and you can define key bindings for the handler’s associated commands. In a handler class exactly one method must be annotated with the @Execute annotation. In additional, you can also annotate one method with the @CanExecute annotation. If you annotate more than one method with the same annotation, the framework calls only one of them. The Eclipse runtime uses dependency injection to provide the parameters of the method. The purpose of these annotations are described in the following table. Marks the method which is responsible for the action of the handler class. The framework executes this method once the related user interface element, e.g., the menu entry, is selected. Marks a method to be visited by the Eclipse framework to check if the handler class can be executed. If a handler class returns false in this method, Eclipse disables the corresponding user interface element. For example, the save button is active if the handler class returns true in the @CanExecute method. The default for this method is true, which means, if the handler class can always be executed, it does not need to implement a @CanExecute method. The following example demonstrates the implementation of a handler class. A handler instance does not have its own Eclipse context ( IEclipseContext). It is executed with the Eclipse context of the active model element which has a Eclipse context. In most common cases this is the context of the active part. All required parameters should be injected into the method annotated with @Execute, as you want the handler class to retrieve its runtime information during execution. To ensure that you get the expected values from the active context ALWAYS get the required values injected as parameters into your methods annotated with @Execute or @CanExecute. If a command is selected, the runtime determines the relevant handler for the command. The application model allows you to create a handler for the application, a window and a part. Each command can have only one valid handler for a given scope. The Eclipse framework selects the handler most specific to the model element. For example, if you have two handlers for the "Copy" command, one for the window and another one for the part then the runtime selects the handlers closest to model element which is currently selected by the user. 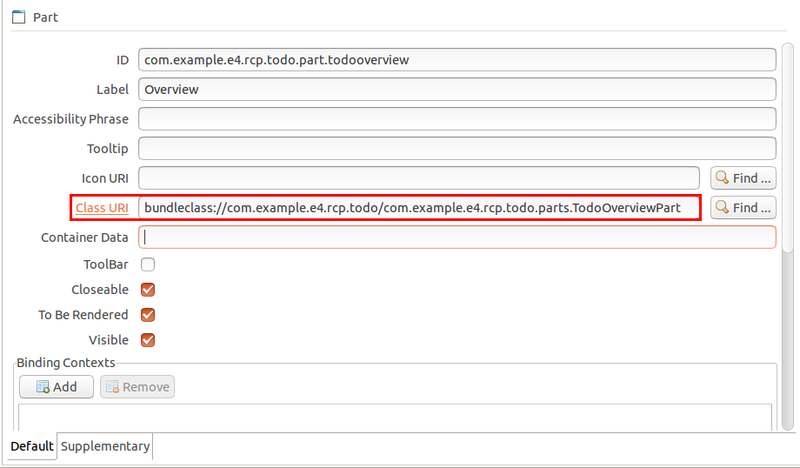 A method annotated with @CanExecute is called by the framework, if a change in the Eclipse context happens. For example, if you select a new part. If the method returns false, the framework disables any menu and tool items that point to that command. You can request the re-evaluation of the @CanExecute methods by sending out an event via the event broker. The application model allows you to define mnemonics. A mnemonic appears as an underlined letter in the menu when the user presses and holds the ALT key and allows the user to quickly access menu entries by keyboard. You specify mnemonics by prefixing the letter intended to be the mnemonic with an ampersand (&) in the label definition. For example, if you use the the label &Save, the S will be underlined if the Alt key is pressed. A good convention is to start IDs with the top level package name of your project and to use only lower case letters. The IDs of commands and handlers should reflect their relationship. For example, if you implement a command with the com.example.contacts.commands.show ID, you should use com.example.contacts.handler.show as the ID for the handler. If you have more than one handler for one command, add another suffix to it, describing its purpose, e.g., com.example.contacts.handler.show.details. In case you implement commonly used functions in your RCP application, e.g., save, copy, you should use the existing platform IDs, as some Eclipse contributions expect these IDs to better integrate with the OS (e.g., on Mac OS, preferences are normally placed under the first menu). A more complete list of command IDs is available in org.eclipse.ui.IWorkbenchCommandConstants. You can define one menu in a part as a view menu. To add a view menu entry, select the Menus entry under the part and append a ViewMenu model entry to it. The application model allows to define more than one menu. But the default Eclipse implementation supports only one menu for a part. You can also define a popup menu for SWT controls via the application model. See the exercise for detailed steps, how to do this. You can also create menu and toolbar entries at runtime with the DynamicMenuContribution model element. This model element points to a class in which you annotate a method with the @AboutToShow annotation. The annotated method is called if the user selects the user interface element. The @AboutToHide annotation can be used to annotate a method which is called before the menu is hidden. In these methods you can dynamically create menu entries. Toolbars in the application model are defined within the Trimbars model element. A trimbar can be defined for TrimmedWindow model elements. Via its Side attribute you define if the trimbar should be placed on the top, left, right or bottom corner of the resulting window. To add a toolbar to a view, set the Toolbar flag on the model element for the part and create the entries in the application model. Such an example setup is displayed in the following screenshot. ToolControl model element points to a Java class which can create controls that are displayed in the toolbar. For example, the following code creates a Text field in the toolbar which looks like a search field. You can add such a ToolControl, for example, to your windows trimbar as depicted in the following screenshot. The following screenshot shows this ToolControl used in an example RCP application. Set the Menu attribute on an toolitem to be able to define a menu similar to the Run As…​ button in the Eclipse IDE. This button is depicted in the following screenshot. You can also pass parameters to commands. For this select a command and press the Add button in the Parameters section. The ID is the identifier which you can use to get the parameter value injected via the @Named annotation. In your HandledMenuItem or HandledToolItem add a parameter and put the ID from the command parameter definition into the Name field. The entry from the Value field is passed to the handler of the command. The ID of the parameter is the important one. This ID must be injected via the @Named annotation and used as Name (second field) during the definition of the menu or toolbar. This is highlighted in the following picture. To get the parameter injected into your handler class you specify the ID of the parameter via the @Named annotation. This is demonstrated in the following code example. Alternatively to injecting each parameter, you can also inject the ParameterizedCommand command and access the parameters via API. The visibility of menus, toolbars and their entries can be restricted via core expressions. You add the corresponding attribute in the application model to the ID defined by the org.eclipse.core.expressions.definitions extension point in the plugin.xml file. To add this extension point to your application, open the plugin.xml file and select the Dependencies tab in the editor. Add the org.eclipse.core.expressions plug-in in the Required Plug-ins section. Afterwards select the Extensions tab, press the Add button and add the org.eclipse.core.expressions.definitions extension. You define an ID under which the core expression can be referred to in the application model. Via right-click on the extension you can start building your expression. The following example can be used to restrict the visibility of a menu entry based on the type of the current selection. You will later learn how to set the current selection. Please note that the variable for the selection is currently called org.eclipse.ui.selection. In Eclipse 3.x this variable is called selection. You can assign this core expression to your menu entry in the application model. It can be used to restrict the visibility of model elements. This approach is similar to the definition of core expressions in Eclipse 3.x. The values available for Eclipse 3.x are contained in the ISources interface and documented in the Eclipse core expressions wiki. Eclipse 4 does not always support the same variables, but the wiki documentation might still be helpful. You can also place values in the IEclipseContext of your application and use these for your visible-when evaluation. The following code demonstrates an example handler class which places a value for the myactivePartId key in the context (you will learn more about modifying the IEclipseContext later). The following shows an example core expression which evaluates to true if an myactivePartId key with the value com.example.e4.rcp.ui.parts.todooverview is found in the context. This core expression can get assigned to a menu entry and control the visibility. It is also possible to define key bindings (shortcuts) for your Eclipse application. This requires two steps, first you need to enter values for the Binding Context node of your application model. Afterwards you need to enter the key bindings for the relevant binding context in the BindingTable node of your application model. A binding table is always assigned to a specific binding context. A binding context can have several binding tables assigned to it. Binding contexts are defined hierarchically, so that key bindings in a child override the matching key binding in the parent. Even though they sound similar a binding context is used for keybindings while the Eclipse context (IEclipseContext) is used as source for dependency injection. The binding context is identified via its ID. 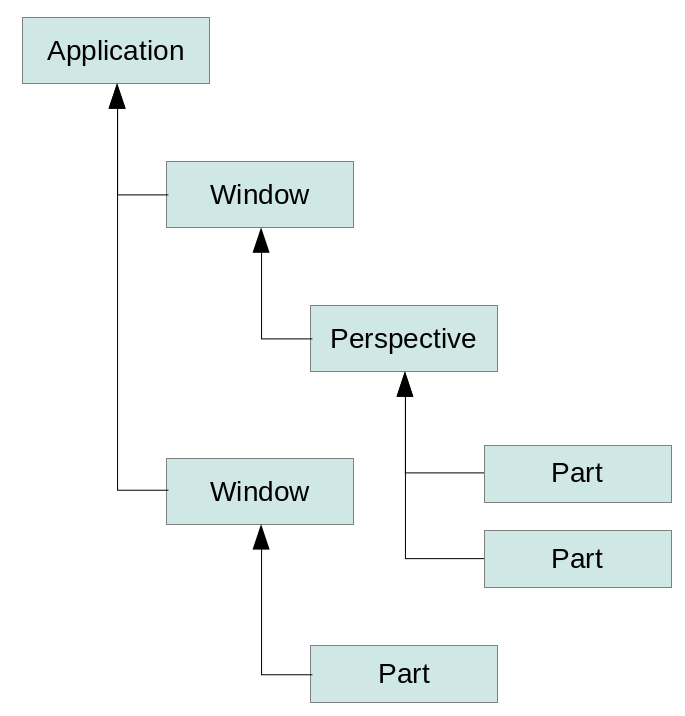 They can get assigned to a window or a part in the application model. This defines which keyboard shortcuts are valid for the window and which are valid for the part. Eclipse JFace uses predefined IDs to identify binding contexts. These IDs are based on the org.eclipse.jface.contexts.IContextIds class. JFace distinguishes between shortcuts for dialogs, windows or both. The following table gives an overview of the supported IDs and their validity. As an example, Ctrl+C (Copy) would be defined in dialogAndWindows as it is valid everywhere, but F5 (Refresh) might only be defined for a Window and not for a Dialog. The BindingTable node in the application model allows you to create key bindings based on a binding context. For this you create a new BindingTable model element and define a reference to the binding context via its ID. In your key binding entry you specify the key sequence and the command associated with this shortcut. The control keys are different for each platform, e.g., on the Mac vs. a Linux system. You can use Ctrl, but this would be hardcoded. It is better to use the M1 - M4 meta keys. These values are defined in the SWTKeyLookup class. If there are several valid key bindings defined, the ContextSet class is responsible for activating one of them by default. ContextSet uses the binding context hierarchy to determine the lookup order. A binding context is more specific depending on how many ancestors are between it and a root binding context (the number of levels it has). The most specific binding context is considered first, the root one is considered last. You can also use the EContextService service which allows you to explicitly activate and deactivate a binding context via the activateContext() and deactivateContext() methods. You can assign a specific binding context to be active while a part is active. Key bindings assigned to a part are valid in addition to the key bindings provided by the currently active binding context, i.e. your global key bindings are still active in addition with the key bindings of the part. In this exercise you create commands and handlers for your application. Afterwards you will create menu entries using these commands. Open the Application.e4xmi file of your com.vogella.tasks.ui plug-in and select the Commands entry. This selection is highlighted in the following screenshot. Via the Add…​ button you can create new commands. The name and the ID are the important fields. Create the following commands. Create the com.vogella.tasks.ui.handlers package for your handler classes. All handler classes implement an execute() method annotated with @Execute. Using this template for all classes, implement the following classes. Select the application-scoped Handlers entry in your application model and create the handlers from the following table for your commands. For the definition of handlers the ID, command and class are the relevant information. Use the com.vogella.tasks.ui.handler prefix for all IDs of the handlers. The application model editor shows both the name and the ID of the command. The class URI follows the bundleclass:// schema, the table only defines the class name to make the table more readable. For example, for the handler with the com.vogella.tasks.ui.handler.saveall id uses the following entry to point to his handler class. In your Application.e4xmi file select your TrimmedWindow entry in the model and flag the Main Menu attribute. Assign the org.eclipse.ui.main.menu ID to your main menu. Ensure that this ID of the main menu is correct. You use it later to contribute another menu entry via another plug-in. Add two menus, one with the name "File" and the other one with the name "Edit" in the Label attribute. Also set the org.eclipse.ui.file.menu ID for the File menu. Use com.vogella.tasks.ui.menu.edit as ID for the Edit menu. Add a Handled MenuItem model element to the File menu. This item should point to the Save command via the Command attribute. Add a Separator after the Save menu item and after that add an entry for the Exit command. Add all other commands to the Edit menu. To test if your handler is working, change your ExitHandler class, so that it closes your application, once selected. Validate that your save handlers are called if you select them in the menu. If you use the org.eclipse.ui.file.exit ID for your exit command, the Eclipse framework maps the menu entry to its default menu location on the MacOS. If you don’t see your exit menu, in its defined position, check this location. In this exercise you implement a context menu for a table in your TodoOverviewPart. You connect the menu entry with the delete command. Add the following plug-ins as dependencies to the MANIFEST.MF file of your application plug-in. Create a Popup Menu in the application model for the part which contains the SWT control. The popup menu contains entries, as, for example, a HandledMenuItem. After this the pop menu can be assigned to an SWT control with the EMenuService service which can be accessed via dependency injection. This class provides the registerContextMenu(control, id) method for thgis purpose. The id parameter of the registerContextMenu method must be the ID attribute of your Popup Menu model element. The following pseudo code shows an example for the registration. It uses a JFace viewer, as the popup menu needs to be registered on the SWT control, the example code demonstrates how to access this control. Change the RemoveTodoHandler so that it writes, "Soon, I will really delete your todo". You will change the RemoveTodoHandler to delete the selected todo once you have learned about the selection service. In this exercise you add a toolbar to your application. Select the TrimBars node under your TrimmedWindow entry and press the Add…​ button. The Side attribute should be set to Top, so that all toolbars assigned to that trimbar appear on the top of the application. Add a ToolBar model element to your TrimBar. Add a Handled ToolItem to this toolbar which points to the org.eclipse.ui.file.saveAll command. Set the label for this entry to Save. Validate that your save handler is called if you select Save from the menu or the toolbar. Select the Binding Contexts entry in your application model. Define a new entry with the org.eclipse.ui.contexts.dialogAndWindow ID. As name use "Windows and Dialogs". The resulting entry is depicted in the following screenshot. The name attribute of a binding context entry is not allowed to be empty. Create a key binding for your Save command to the M1+S shortcut. Afterwards create a keybinding for your Exit command to the M1+X shortcut. The required entries are depicted in the following screenshots. Run your program and test it. In this exercise you create a model fragment to contribute a menu entry, a command and a handler to your application model. Create a simple plug-in project called com.vogella.tasks.ui.contribute. The following description abbreviates the plug-in name to the contribute plug-in. In the MANIFEST.MF file, add the following plug-ins as dependencies to your contribute plug-in. Create the com.vogella.tasks.ui.contribute.handlers package and the following class. Select the contribute plug-in as the container and use fragment.e4xmi as the name for the file. On the Extensions tab validate that you have an entry similar to the following screenshot. Ensure apply is set to always. Open the fragment.e4xmi file in its editor. Select the Model Fragments node, right-click on it and add one fragment. Use xpath:/ as the Extended Element ID to extend any application. You need to define to which feature you will be adding to. For Featurename, specify the value commands. Make sure you have the Model Fragment selected and use the Add…​ button to add a Command to your model fragment. Define an entry similar to the following. Create a new model fragment for the handler. The Extended Element ID is again xpath:/, the Featurename is handlers. Add a Handler to this model fragment, pointing to your OpenMapHandler class. Use com.vogella.tasks.ui.contribute.handler.openmap as ID for the handler. Point to the Open Map command and the OpenMapHandler class. Add another Model Fragment and contribute to menuContributions. Add a menuContribution and use org.eclipse.ui.main.menu as parent ID. This assumes that the application you are extending uses this ID, it is the standard ID of the Eclipse IDE. If your Eclipse application uses a difference ID you need to use the id of your main menu. Add a HandledMenuItem which points to your new command. The created entry should be similar to the following screenshot. Add the contribute plug-in to your feature. Start your application via your product. Ensure that you added this new plug-in to your feature and saved the changes. Remember to start via the product to update the launch configuration. You should see the new Map entry in the application menu. If you select this entry a message dialog opens. If the menu entry is not displayed, ensure that your IDs are correctly entered. Also ensure that you either use the clearPersistedState flag or clear the workspace data in your Launch configuration. In this exercise you replace an existing menu entry with another menu entry. Continue to use the com.vogella.tasks.ui.contribute plug-in for this exercise. In the MANIFEST.MF, add the following plug-ins as dependencies to your contribute plug-in. Create the following dialog and handler classes. label.setText("Closing this application may result in data loss. " Create the model processor class. This class removes all menu entries which have "exit" in their ID from the menu with the org.eclipse.ui.file.menu ID. It also adds a new entry. Ensure that your menu entry in the Application.e4xmi file labeled with Exit, contains exit in its ID. In your contribute plug-in register your processor via the org.eclipse.e4.workbench.model extension. Right-click on the processor and select New element. The value from the ID parameter is the ID of the model element which is injected into your processor class. Use org.eclipse.ui.file.menu as id* parameter. This assumes that you used org.eclipse.ui.file.menu as ID for your File menu in the main application model. The ID of the element defined in the extension point must match the @Named value in the processor. If such an element is not found it is not injected into the processor. Start your application. In the model fragment exercises, the contribute plug-in was already added to your product. Ensure that the existing Exit menu entry is removed and your new menu entry with the Another Exit label is added to the file menu. 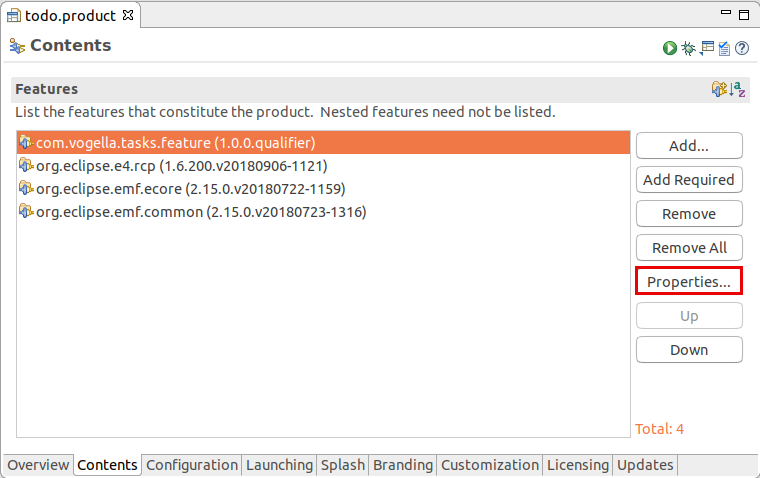 You can also add the pde nature to your project in which you placed the product configuration file, if you want to be able to start your product via a right-click on the product and by selecting Run-as Eclipse Application. The Package Explorer view may have a filter set for .*resources. You can modify this filter via the view menu as depicted in the following screenshot. For this purpose remove the filter in the Package Explorer view for files starting with . (dot) and modify the .project file to the following.